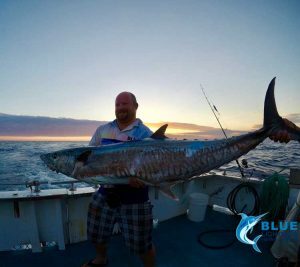 The 2018 Montebello Islands season was something spectacular for Blue Lightning Charters, our biggest year yet. The season flew by and we missed some blogs so we thought a 2018 season wrap up was needed. One of the major highlights of 2018 for Blue Lightning Charters was welcoming SansSouci to the fleet. SansSouci is an impressive mothership with 5 air conditioned cabins perfect for the Montebello Islands. These private rooms provide increased customer comfort and luxury, with two of the cabins featuring private ensuite bathrooms. 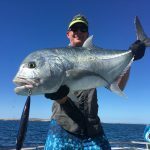 The addition of SansSouci meant plenty of double Montebello Islands Charters with plenty of anglers getting a taste of the awesome Monties fishing action. We loved welcoming such a great number of anglers with a range of experiences to share with us all. 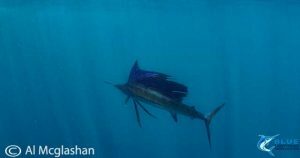 2018 proved to be our biggest year to date on Sailfish. 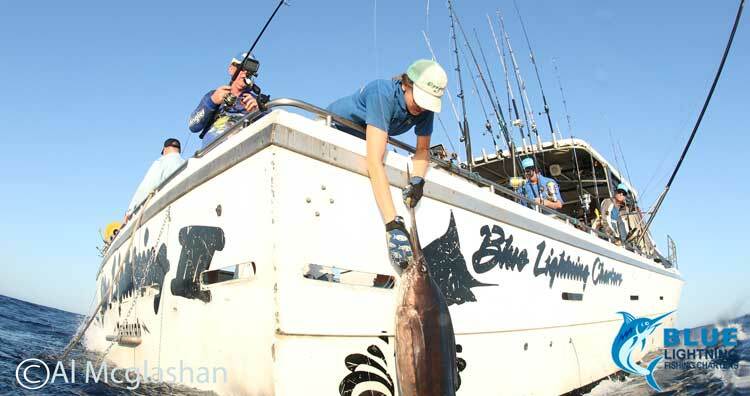 Anglers on board Blue Lightning Charters reeled in a total of 290 Sailfish during the 7 month Montebello Islands season. While Captain Chad and myself have become used to double hook-ups the 2018 season brought us up to 7 way hook ups which was an awesome! 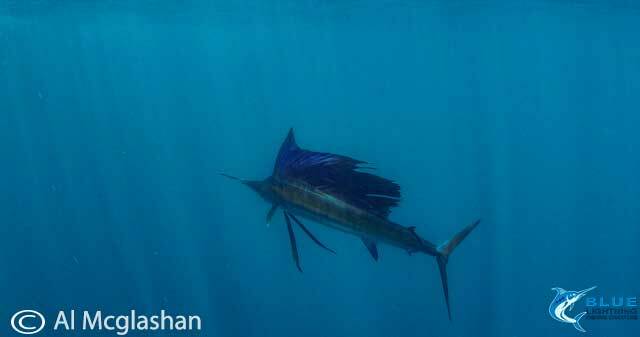 We even had 8 anglers hooked on Sailfish at one point before one was lost. 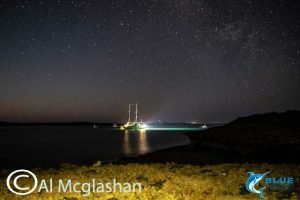 With 5, 6 or even 7 anglers on the deck hooked on Sails it was the sort of chaos the Blue Lightning Charters team thrives on, we were absolutely loving it. Captain Chad was in his element loving spending days on billfish, manoeuvring the boat for the ultimate fishing experience for our customers. 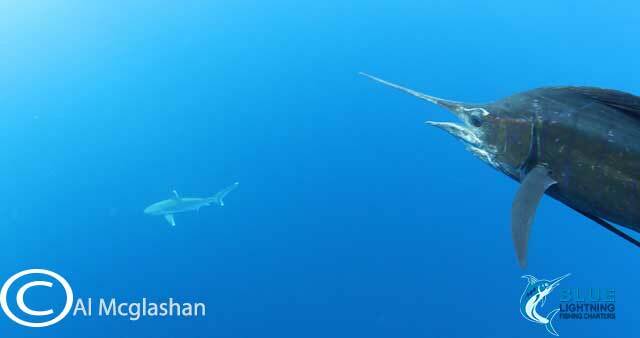 As always we returned ALL Sailfish back to the ocean to preserve fish stocks for the future. Well not quite stars but we were very excited to welcome Al Mcglashan from Fish’n with Mates for a charter to the Montebello Islands. 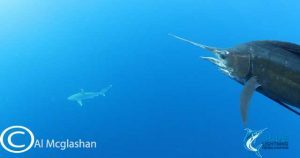 Al got some sensational footage of all the best parts of a Blue Lightning Charters Montebello Islands charter. We look forward to sharing a release date with you very soon. 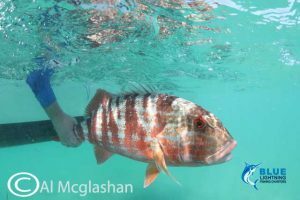 On top of all this excitement the Montebello Islands turned on their usual awesome fishing. 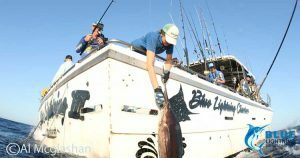 All our customer’s were treated to a great array of Northern WA fish species. There were more firsts and biggest of a species than we could count. The crew caught some GT’s both land and water based. The Montebello Islands are almost famous for their impressive Coral Trout stocks, in 2018 the crew were lucky enough to reel in impressively large Coral Trouts. Spanish Mackerel were on the bite all season with customer’s catching plenty of big ones. 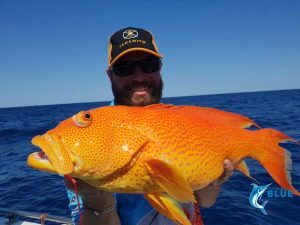 The reef fishing at the Montebello Islands in 2018 was definitely a highlight with customers catching plenty of great quality reef fish. In 2018 we were very excited to welcome our first ever group of stand up paddle boarders for a charter to the Montebello Islands. The crew were lovely and had some seriously impressive moves on their SUPs. We loved showing them some of our favourite Montebello Islands breaks as well as showcasing the beauty and history of these spectacular islands. We can’t wait to welcome the crew and plenty more SUP riders back to the Monties. We are gearing up for another epic year at the Montebello Islands. There is VERY limited availability on SansSouci while Blue Lightning III is already sold out. We look forward to Captain Chad’s baby Reely Black back to the Montebello Islands in 2019, providing a great vessel for game fishing and sport fishing. For now we are busy prepping for the season and making sure the entire fleet is ready to welcome our incredible customers!